The issue of pent up energy is a common challenge for many dog owners. It can manifest itself in many ways: destroying items in the home, excess barking, pulling on the leash, bratty/unwanted behavior (jumping, mouthing, etc. ), among other things. Those challenges are rarely the actual problem, they are usually a symptom of a greater underlying cause… pent up energy. That’s why it is essential to Relieve Your Dog’s Energy. I am not one to generalize & base my training on a dog’s breed, as each dog is unique and with a large gradient of difference between dogs of the same breed. However, certain dogs may be more inclined to experiencing pent up energy. Often times these dogs are of the “working breed” category. These dogs may require significant exercise and mental stimulation several times per day. 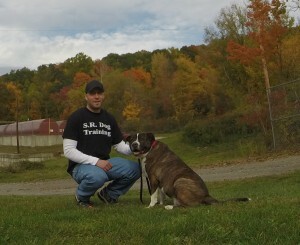 It’s essential to be aware of each dog’s individual disposition and plan training accordingly. Far too many owners think a “doggie door”, fenced in yard or chew toys are suitable outlets for exercise and mental stimulation, but they’re not enough. These are great supplements to the fundamentals, but NOT a replacement. What are the fundamentals? Structured walks, obedience training, and structured play. Canines have two forms of energy, mental and physical (just like us). We must provide appropriate outlets for this energy, otherwise the dog will come up to their own devices on how to relieve this energy. In most cases it will be in a way we deem inappropriate (i.e. destroying items in the home, hole digging in the yard, etc.). Structured walks and play sessions are the best outlets for physical energy and obedience training for mental energy. A structured play session is not a replacement for a structured walk, it should be used in combination. To learn more, see my previous articles & videos on How to Play a Structured Game of Tug with Your Dog and How to Teach Your Dog to Play Fetch. The last thing I want to mention is that your dog’s mental and physical energy are both renewable resources. This means they dog will get tired from exercise at one point in the day, and they will be ready and raring to go again after a few hours of rest. I usually recommend my clients take their dog through 5-10 minutes of obedience training, a structured walk, and/or short play session before leaving for work/school. That way their dog will be fulfilled when they leave for the day (decreasing the probability of destruction when they are gone). Since energy is a renewable resource, it would be wise to redo this routine again as soon as you get home. If your dog is left alone for 6+ hours straight, I recommend you have someone take him/her out during that time. Not only to go to the bathroom, but also to relieve the energy that is building. This will help make things easier for you when you arrive home after a long day of work. You will make your dog’s life dramatically happier and more complete by fulfilling their mental and physical energy needs. In turn, making your life easier and less-stressful with a well-behaved dog.